Riopelle (b. 1923), "the leading Canadian abstract painter of his generation," participated in the last International Surrealist Exhibition and was involved with the Lyrical Abstract group of painters (Pierre Soulages, Hans Hartung, Sege Poliakoff, Maurice Esteve, Notman Bluhm, Joan Mitchell, and Sam Francis). According to his biography in The Oxford Dictionary of Twentieth-Century Art, he was encouraged by André Breton and Joan Miró in the late forties. He and Joan Mitchell lived together in Paris during the fifties and sixties and their work during this period shows their mutual influence upon each other. He was awarded the UNESCO Prize at the 1962 Venice Biennale. He was represented in New York by the Pierre Matisse Gallery and in Paris by Galerie Maeght, the two most important art galleries in the world from the forties to the seventies, and at least one of his paintings has sold at auction for over one million dollars. 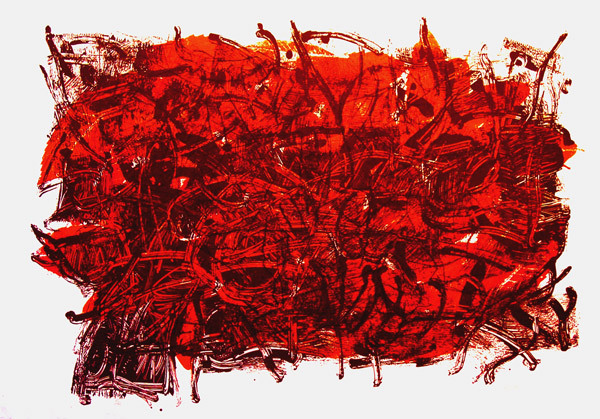 Riopelle has had major retrospectives at the Venice Biennale (1962), the Musée d'Art Moderne de la Ville de Paris and the Musée National d'Art Moderne, Centre Pompidou in Paris, the Musée du Québec in Montréal, and museums in Bâle, Caen, Caracas, Charleroi, Cologne, Hanover, Helsinki, Krefeld, Mexico City, Nancy, Rouen, St. Etienne, St. Paul de Vence, Toronto, and Wuppertal. His most recent gallery show, "Jean-Paul Riopelle: Oils and Works on Paper 1946-1970," took place during March and April 2000 at Gimpels Fils in London. A projected 6-volume catalogue raisonné of his paintings and works on paper is currently underway; so far, only volume one has appeared in print: Yseult Riopelle, Jean Paul Riopelle: Catalogue RaisonnÈ 1939-1953. Tome 1. (Montreal: Hibou Editeurs, 1999). Selected Bibliography: Charles F. Comfort, ed. Jean-Paul Riopelle: Paintings and Sculpture (Venice: XXXI International Biennial of Art, 1962); Michel Martin, ed. Jean-Paul Riopelle, Peinture 1946-1977 (Paris/ Grenoble: Centre Georges Pompidou, 1981; essays by Georges Duthuit, André Breton, Patrick Waldberg, Werner Schmalenbach, Guy Viau, Jacques Dupin, Pierre Boudreau, Franco Russoli, Paul Auster et Thomas B. Hess for retrospectives at the Musée d'Art Moderne in Paris and the Musée du Québec); National Gallery of Canada, Jean-Paul Riopelle: Painting and Sculpture/ Peinture et Sculpture (Ottawa: National Gallery of Canada, 1962); 36. Yseult Riopelle, Jean-Paul Riopelle: Catalogue Raisonné 1939- 1953 Vol. 1 (Italy: Hibou Editeurs, 1999); René Viau, Jean-Paul Riopelle, la traversée du paysage Canada: Leméac, 2002). Jean-Paul Riopelle, Feuilles III. 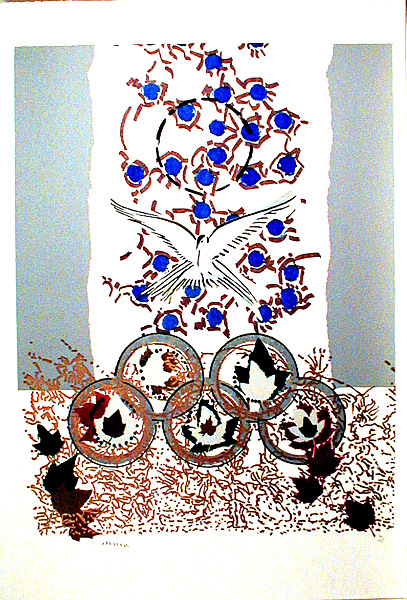 Original color lithograph, 1967. 75 signed and numbered impressions on Lana paper of which this is n. 73/75. A very gestural piece published by Galerie Maeght (Paris). Small handling crease in lower right corner. Image size: 720x1050mm. Price: SOLD.